Our 7 night stay at Villa Montecastello was absolutely the best vacation we've ever had. There simply are not enough superlatives to describe how stellar every element of our stay was. Jens and Barbara are wonderful hosts and create an inviting, comfortable and relaxing atmosphere to enjoy the best of Tuscany. We will definitely be planning another stay. This place is magical!...We made ourselves dinner in our huge kitchen using freshly picked eggplant, zucchini, basil, parsley and tomatoes from Jen's organic garden. What an experience!! In the morning we went swimming in the amazing swimming pool looking onto the stunning views of Tuscany. If you are looking for a beautiful, old villa enriched in history and stunning surroundings, this is the place! We did not want to leave and it was the perfect way to end our trip. Truly incredible!! My fiance and I stayed at the Villa for 5 nights and absolutely LOVED every moment! We have so many lovely memories I don't even know where to begin!! The Villa is emmaculate. Think old country rustic italian with five star standards... Jens is a second to none chef, so if you go make sure you book yourself a cooking class with him. You won't regret it. It was a highlight of our trip. This was truly one of our best trips ever. We stayed at Villa Montecastello with a group of 11 adults and 2 children. I worked with Jens for many months planning our stay and he made the process simple. He responded to my emails quickly and was very accommodating to my many requests... The grounds are gorgeous, which you can see from the photos, but they really don't capture the complete sense of peace you feel when you are there in person... If you are considering Villa Montecastello for your own trip I highly recommend it. You won't be sorry! This was our second trip to Montecastelli - and Jens and Barbara were wonderful hosts again. I just can't think of a better location in Tuscany. The villa is simply spectacular. Well appointed rooms and sitting areas, dining options in the courtyard, beautiful views from its location on top of a large hill, pool... it literally is a perfect location for family reunions, bike trips or just touring Tuscany. 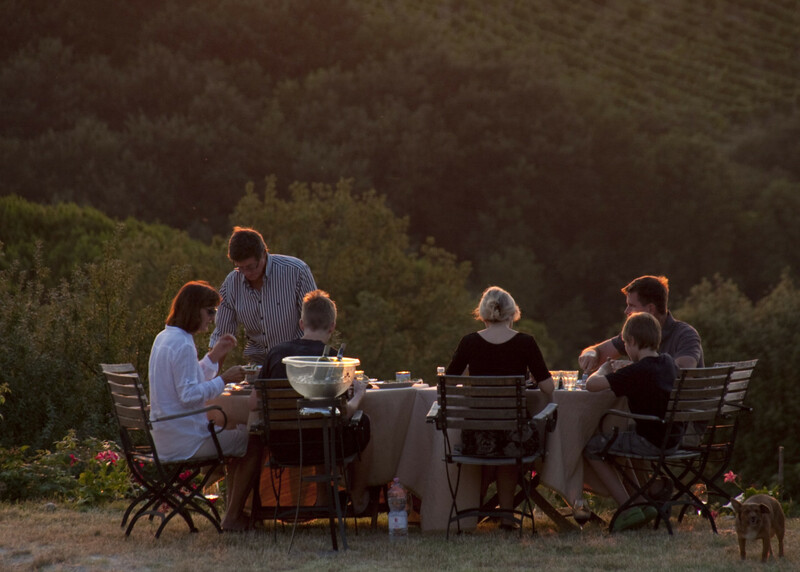 One of our favorite things is - despite all of the great food and wine throughout Tuscany - having one or more dinners prepared by Jens and his staff. Jens is an incredible chef. We've had four dinners there - each different and each leaving a lasting memory. We also got a tour of Jens' olive processing operation (he has the BEST olive oil in Tuscany), his meat curing room (it smelled so fantastic that I had to ask if I could sleep in there but he wouldn't let me) and his extensive vegetable gardens. Absolutely perfect! Villa Montecastello lived up to every dream I ever had of staying in a Italian villa. The place is beautiful. Perfect in everyway. Jens was so knowledgeable. Extremely helpful and such a wonderful chef. I would certainly recommend staying here and would stay here again on future returns to IT. Thanks Jens and his wonderful staff! This place is amazing!! My husband and I stayed here for a week with 8 of our friends and we had such an incredible experience. Jens, his lovely family, and staff should win awards for their service and professionalism. The food was outstanding, the rooms were very clean and comfortable, and the grounds were breathtaking. Please do not miss this once in a lifetime opportunity to truly experience the beauty of Tuscany and all that it has to offer!! This was my first trip to Italy and I know there will be many more to follow. We booked the trip because I was interested in taking a week long cooking class at the Villa with a chef from a large USA city. The chef was unable teach the class, however, I still wanted to take the class and inquired if anyone else could do it. I was very happy to learn that the owner, Jens, teaches cooking classes. It could not have turned out any better. I had the best time when I was in the kitchen learning to cook authentic Tuscan food. We can't begin to tell you how special the Villa and our time with them meant to us. We celebrated our wedding there and it was everything we dreamed it would be and more. Antonella and the staff made us feel genuinely welcomed. From the champagne and personal tour of the estate upon our arrival, to the recommendations of where to explore in Tuscany, to handling all of the details of our wedding ceremony, to the incredible candlelight wedding dinner overlooking the countryside. Truly special. We loved every minute of it and will be back! We'll have wedding anniversaries to celebrate! Thank you, thank you. If TripAdvisor allowed for more than 5 stars, I would give Villa Montecastello 10! My recent stay at Montecastello was as fantastic as my first trip there in 2012. Three years ago I came with a large group of friends, and this trip it was just my mother and I. No matter the size of the party, the experience each visit was pure magic! Jens, his family, Antonella and all the staff are incredibly welcoming, and they have absolutely mastered the art of hospitality. The attention to detail in creating a comfortable and luxurious space everywhere you turn is equal to none. The accommodations are beautifully appointed, the views breathtaking, the breakfast service delicious, and the grounds well-maintained... I cannot possibly recommend the experience that is Villa Montecastello highly enough. The Villa Montecastello is a superlative experience. It is an amazing cross between luxury and family - on the one hand, you arrive into a perfectly appointed suite, complete with fresh flowers from the garden and linens that I wanted to bring home with me - and on the other, you immediately feel a part of Jens's and Barbara's family. The views are spectacular, the food impressive (for a small additional fee, you can arrange meals at the Villa), and the service impeccable. Particular thanks to Antonella, who runs the inn, who could not have done a better job at making this a special stay. I am already trying to figure out how I can get back for my next stay. If you are looking for the most beautiful setting, with fantastic accommodation and the most welcoming of hosts, then book a holiday here. I could go on finding superlatives to describe every aspect of this holiday. Our family stayed here for a week in April and we felt extremely relaxed and looked after from the minute we arrived. Even upon our arrival at night time, we were absolutely stunned by the romance of the place. ...I can not recommend this place enough, and it was truly a great pleasure to stay here. I don't think that I will ever experience such an idyllic and beautiful place like this. If your looking for a wedding venue I can wholeheartedly say that it could not get any better. This truly was a spectacular experience, Villa Montecastello really IS as good as it's pictures and all the other reviews say it is. We stayed there for four nights and were blown away by all that Jens and his wife Barbara have created in this amazing setting... I think the best test of a destination is if you would travel to the other side of the world to go there again.... and I'd jump on the plane tomorrow if I could. We will definitely be back and I would encourage anybody that is looking for a holiday/break in Tuscany to stop looking and just book in at Villa Montecastello.